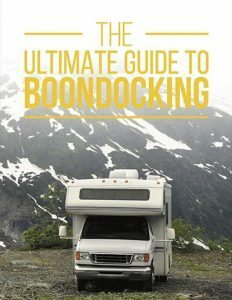 Many people long for the freedom and ability, to explore and have adventures, provided by having an RV or travel trailer at their disposal. For most, however, owning one seems like a pipe dream. The price of new campers vary widely depending on the size, level of luxury and number of amenities. Some cost around $24,000, but many run $100,000, with others costing even as much as $1,000,000! 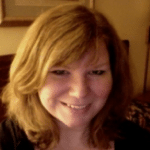 When someone considers opening his or her options to the used market, the price reduces exponentially. Or, the hippy “flower power” designs of the 1960s come to mind, with their psychedelic patterns and bright colors. 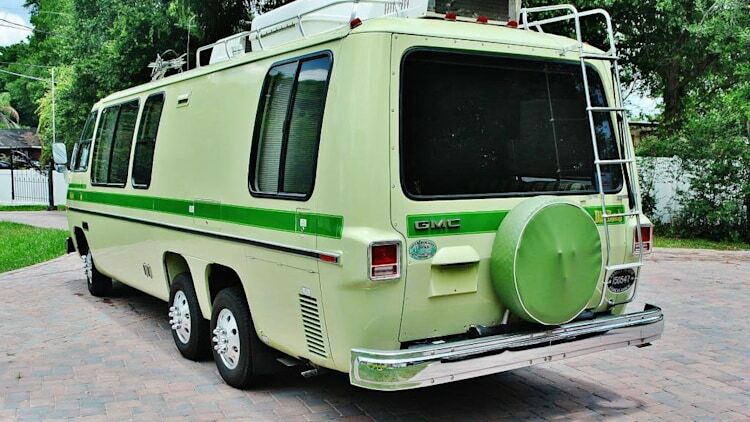 Although this gorgeous GMC motorhome has existed since 1976, it has only driven about 62,000 miles, which isn’t very far for an RV. It has had few owners throughout its existence, and has never been repainted or refurbished. 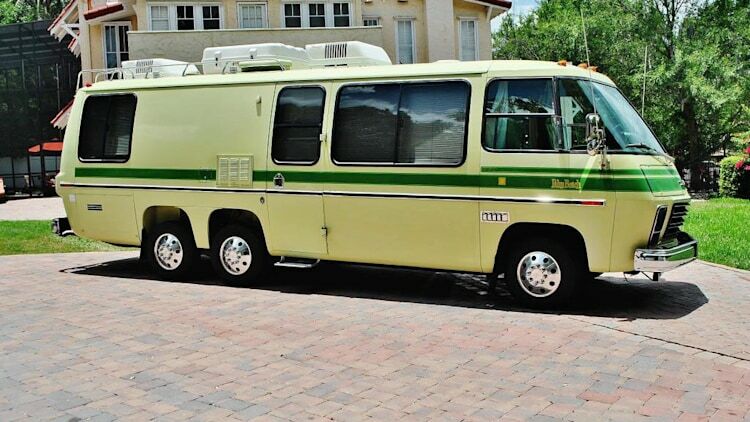 This RV’s power comes from a 7.5-liter Oldsmobile V8 (455-cubic-inch) engine and a 3-speed Turbo-Hydromatic automatic transmission. With front wheel drive and a self-leveling air suspension for the eight rear wheels, the passengers are guaranteed a comfortable ride. Unique on contemporary roads, the exterior of the Green Machine initially grabs attention with a fresh lime-color, with beige and green stripes that really pop. The next things a passerby is likely to notice, are the polished bumpers, and the mint condition that the decades-old GMC remains in. The lime-colored, wheel cover is a nice touch that neatly pulls the whole design together. 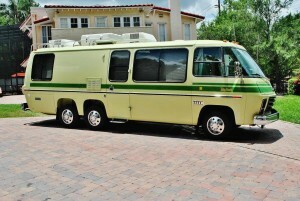 When spotted on the highway or parked in a KOA, this motorhome is sure to be the subject of many conversations. The retro look doesn’t stop at the door. 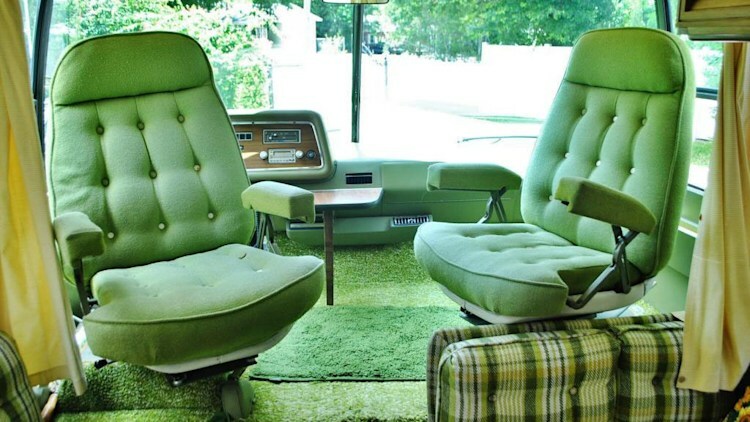 Straight from the 1970s, wall-to-wall, green-shag carpet fills the space. 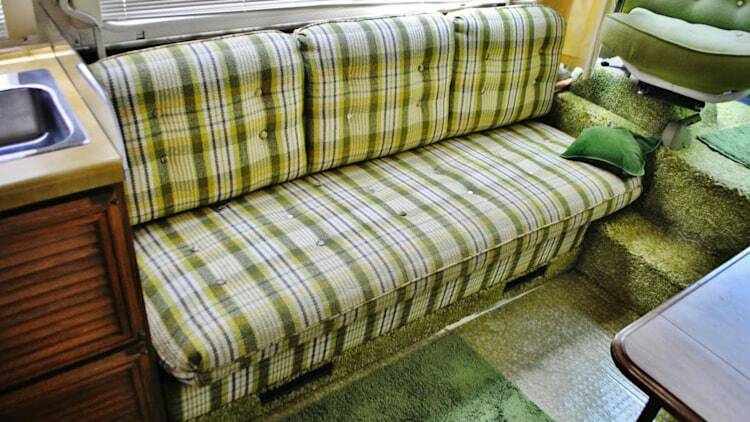 The monochromatic-green upholstery, and a green plaid sofa, finish off the design. 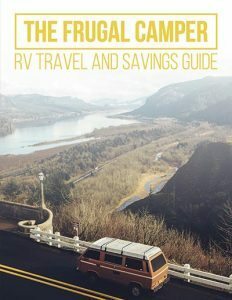 Although, it isn’t new, it still features all of the necessities for lengthy road trips and camping for extended periods. It also makes a fun, recreational space when sitting in the driveway. 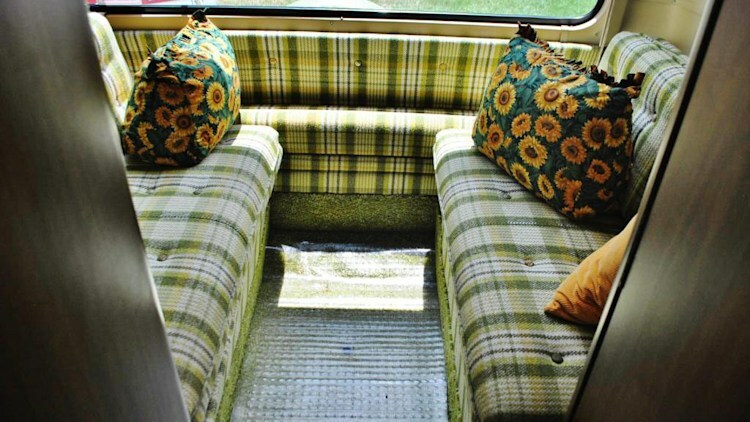 There is more than enough room to relax in this motorhome. 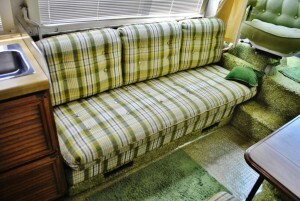 Along with the Captain’s chairs, a comfortable, plaid-green sofa was installed to maximize sitting space. 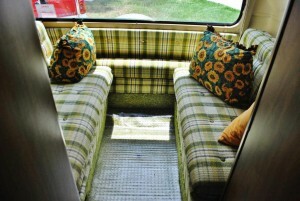 The sitting room doubles as the sleeping space and provides adequate space for both. With a den-like arrangement, it almost has the sunken-living-room feel, that was popular at its conception. The large, rear window adds to the illusion of spaciousness, and lets in natural light. It also provides a focal point for the decor. 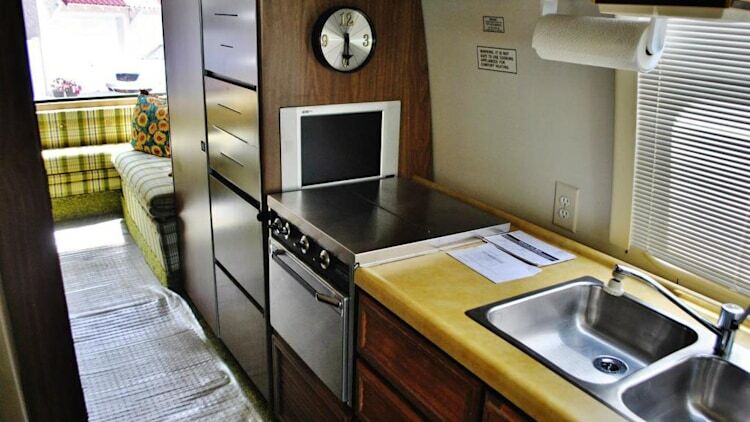 The galley is in the traditional 1976-style with the mustard-colored countertops that were fashionable at the time. 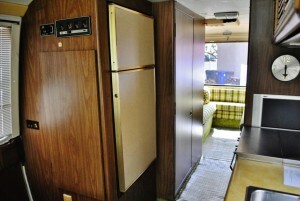 It features a range and oven, mini-fridge with a freezer and a two-basin sink, as well as numerous wood-faced cabinets. 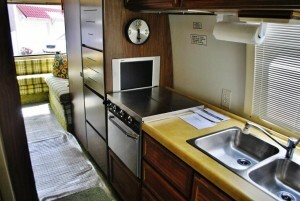 The only modern element, to this motorhome, is an HD TV installed next to the stove. It increases the enjoyment level without distracting from the decor. 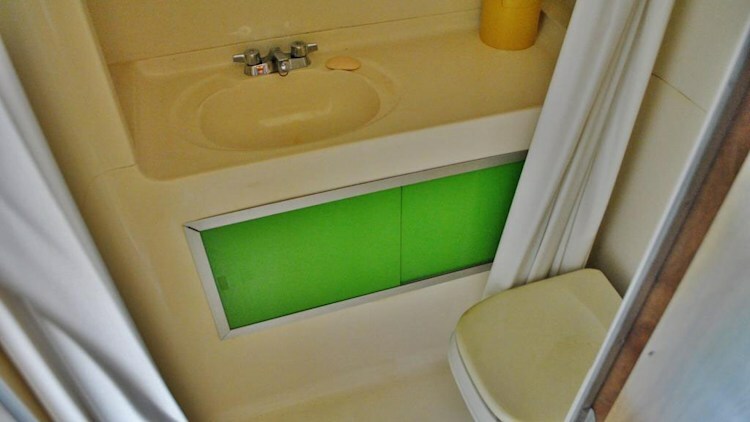 Although small, the matching mustard-and-green bathroom is fully functional. It consists of everything one would expect to find. 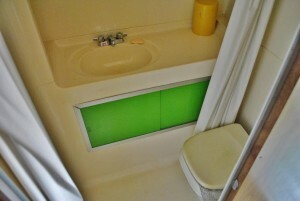 The Spartan fixtures include the toilet, the single-basin sink and the shower area. Curtains help someone retain privacy, when visiting this room. What more is there to say? 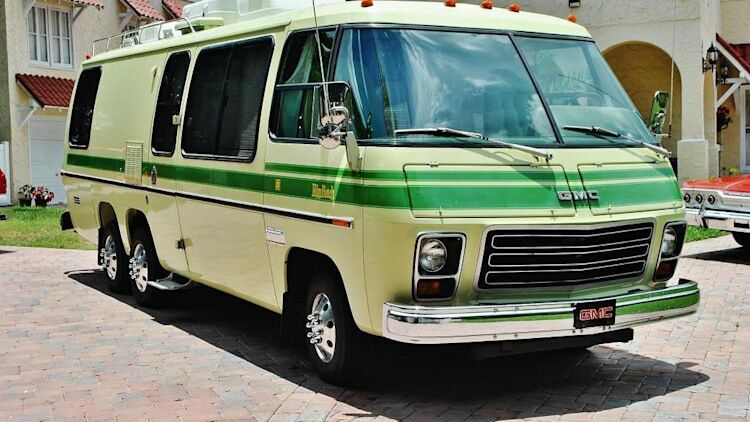 Although this Green Machine may not be everyone’s idea of elegance, it does demonstrate that one can find a used, or vintage, motorhome that is road-worthy and attractive, for a fraction of what a new one would cost. 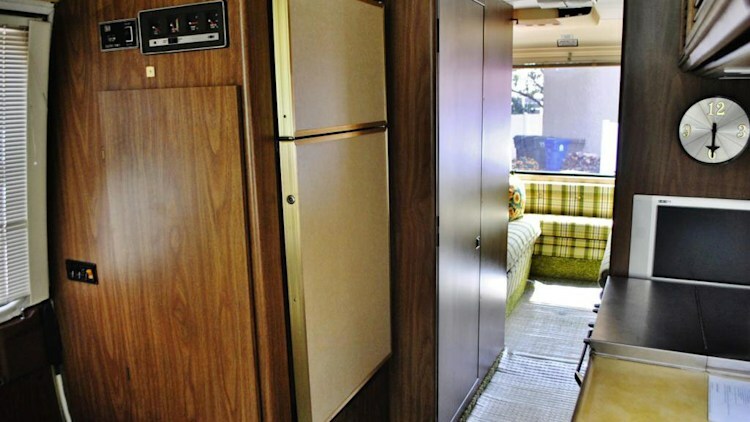 With a bit of care and attention, “pre-loved” RVs and trailers retain their value as well, if not better than other vehicles. 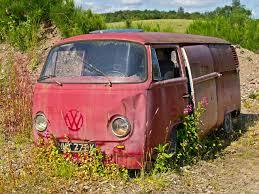 Whether you fall in love with a funky camper in great shape or choose one that is a little damaged or outdated that you plan to refurbish in your personal style, a used model can be a great bargain.